A young Victorian woman stands on a beach and stares out past the crashing waves, far out into the ocean, wondering where her sweetheart is now. His ship sailed months ago, and he’s not due to return for years. She has no way to hear his voice saying he loves her. The only comfort she has is the coin in her hand. She runs her fingertips over his initials engraved on one side and forget-me-nots on the other, and she feels soothed. In this world before voice mail, text messages, or quick-and-easy photo snapshots, love tokens—common coins engraved with sentimental messages—offered long-distance couples tangible reminders of their bond. Rosin, who is also the president of the Ephemera Society of America, has collected “tokens of love” dating back to the 1400s, encompassing everything from thimbles, rolling pins, and hard-carved wooden spoons to scrimshaw corset busks, odor-blocking vinaigrettes, and paper-and-lace Valentines that have been fashioned into gifts expressing romantic love or an intention to marry. But “love tokens” are literally tokens, coins that have been taken out of circulation, sanded or scraped flat on at least one side, and engraved with letters and designs denoting a sentiment. 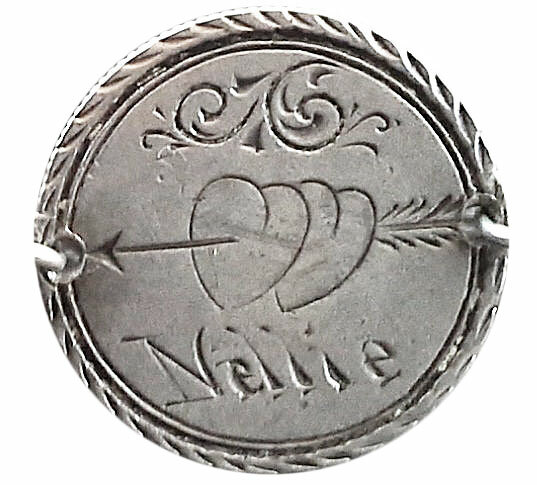 While love tokens can be found all over the world, they reached their height of popularity in the United States and Great Britain in the late 1800s, at a time when the populations of both countries were eager to embrace sentimentality. By 1865, nearly everyone in the United States had lost someone during the Civil War. More aware of mortality, Americans wanted to keep their loved ones close and express their feelings. In England, British subjects had followed Queen Victoria’s passionate romance with Prince Albert and mourned his death in 1861. She made it fashionable on both continents to wear jewelry revealing the contents of your heart—be it love or grief. Of course, the tradition of love tokens had precedence. Starting in the late 16th century, the French would fashion 13 specially carved coins, still considered valid currency, to be given to a young couple at their wedding. These treizains, which evolved into modern-day marriage medals, would be blessed by the priest during the ceremony. Rosin has a few, and clasped hands and an arrow piercing two hearts were common motifs. In England, men would carry coins for good luck. To distinguish their charms from the rest of their pocket change, they would bend two edges of the coin in opposite directions on opposite sides. These were known as “benders,” and if men ever gave their lucky coins away, it would have to be to someone they cared about deeply. Around the late 1600s or early 1700s, average folk in Britain figured out how to make their own designs on coins, with a technique known as pinpunching, which just required a sharp metal object, like a pin, and hammer, to pound out a series of dots. The first English coins that were actually engraved instead of pinpunched used the simple lines you see on scrimshaws, and these most often feature names and dates in honor of births, weddings, anniversaries, and deaths. 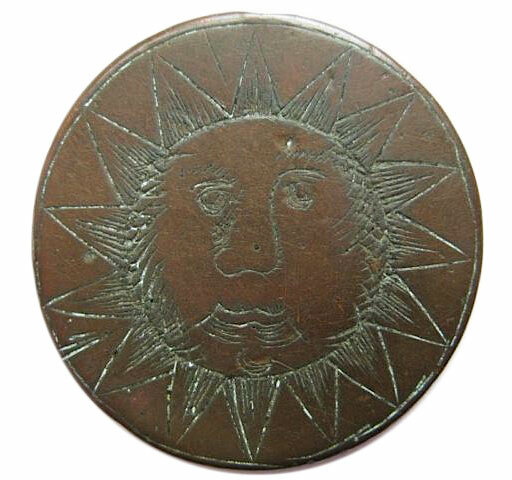 Eventually, everyone from folk artists to highly skilled artisan engravers made such “engraved coins,” as they were known in England, usually from copper coins like half pennies, pennies, and two pence. “You have to imagine how scarce things might have been and how much time someone took to carve it, perhaps staying up at night to engrave a coin,” Rosin says. Some of the most heart-rending early love tokens come from the late 1700s, when men (and more rarely women) were convicted of serious and petty crimes by the British government and shipped off to penal colonies in Australia—to return in seven years, or not at all. 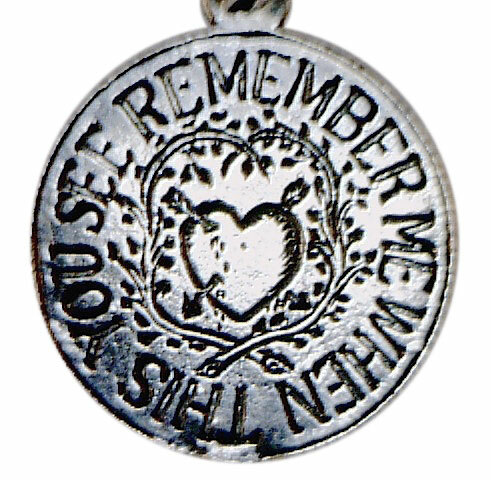 Soon-to-be-exiled prisoners and their loved ones would exchange love tokens, called “prisoner tokens,” with phrases like “When this you see, remember me” engraved on them. Love tokens evolved separately in the United States. During the Civil War, soldiers found they had little use for the change in their pockets that they likely couldn’t spend in enemy territory. So the men would put their coins to practical use: If a soldier lost a button, all he had to do was drill two holes in a coin. Others would have their personal information engraved on coins and then keep them as a dog tag. Some coins would also be engraved as a romantic gift for a woman waiting back home. Gale explains that as chromolithography became more affordable and started to replace the letterpress in the late 1800s, wood-type engravers turned to hand-engraving coins as a way to survive. By 1870s, their elaborate, beautifully engraved love tokens became a full-on obsession for Victorians, in both the United Kingdom and the United States. A suitor—or a family member or friend—would give their beloved a token with their own initials. “It is a memento of a person that gave it to you,” Bastable says. 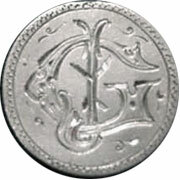 When the love token didn’t feature the giver’s initials, Gale explains, often the initials on the token would mean that he was proposing marriage, before diamond engagement rings were the thing. “If a guy in 1876 wanted to get married, he could take a dime out of circulation and engrave it with the initials from his family name and the girl’s first name. If she accepted and wore it, they were engaged. That’s one of the ways you got engaged back then, before DeBeers really marketed diamonds and before there were jewelry stores all over the place. Today, pocket change might not seem like anything special, but back then, coins were made of precious or semi-precious metals. For that reason, love tokens would be made into jewelry, particularly pins, earrings, and bracelets. 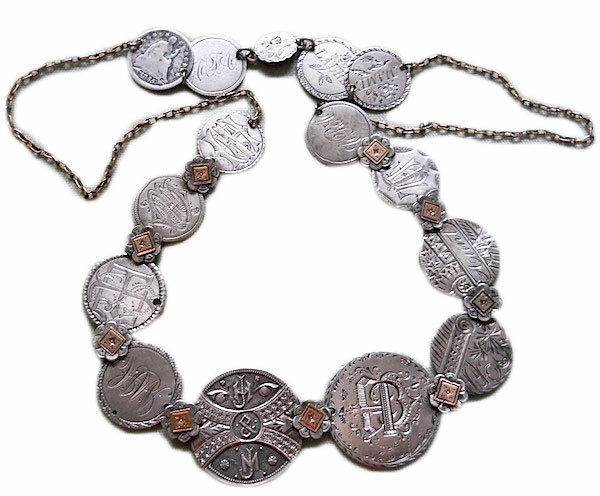 A mother might have a bar pin of multiple dimes soldered in a row, which she wore at her collar, or a bracelet made of linked dimes or a series of dimes attached to a metal band or a hinged bangle, each coin engraved with the initials of her husband and all their children. Bastable says that the Liberty seated dime was the coin most commonly engraved into a love token, followed by the half dime and the quarter, probably because those coins worked so well as jewelry. In fact, love tokens on half cents and 20-dollar gold coins are the most difficult to find—most collectors will never see one in their lifetimes. That’s because half-cents predate the peak of the love-token fad, and before then, the giver of a half-cent token might come across as cheap. Whereas $20 was a huge amount of money back then. “It would take someone incredibly wealthy to give that as a gift,” Bastable says. Besides bracelets and bar pins, love tokens were soldered to pieces of wire to make earrings, attached to stick pens, and made into cufflinks for men. Other love tokens were chained together to form necklaces, belts, or pocket-watch chains Some love tokens were even attached to rings, belt buckles, or chatelaines. Collectors of love tokens are always on the hunt for rare specimens. 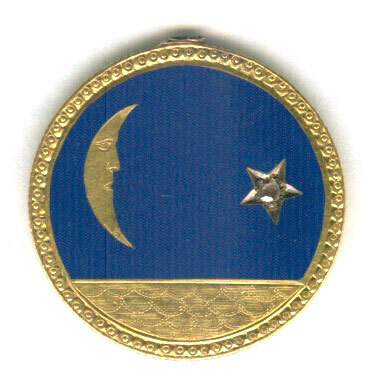 It’s much harder to find a love token that’s been enameled (black for mourning, blue for true love), or embedded with stones (usually turquoise, red garnet, and pearl), or cut with holes or into other shapes. Similarly, collectors are fond of tokens engraved with images—which are far less common than initials, names, relations, or dates. The tricky piece is that most flowers on love tokens are not jeweled or enameled to give them color, so a rose could have dozens of meanings—from love to mourning to friendship—messages that would normally be determined by color. Some symbols are universal: A horseshoe means “good luck,” while lighthouses signify “a safe harbor.” A musical instrument or tool probably meant something more personal to the giver or recipient, like their trade or talent. “You don’t see hearts that often, but that’s what everyone would think of as an indication of love,” she says. 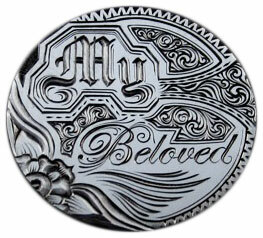 Engraved coins meant to commemorate events or bestow honors upon a person also fall under the umbrella of love tokens. And sometimes love tokens celebrated not-so-loving phenomena. “A 20-dollar gold love token says, ‘In Terror of the Tramps,’ and it depicts a little man sitting in a cage that’s in the shape of a chair,” Bastable says. “On the reverse, it honors Sanford Baker, the inventor of this cage known as the ‘tramp chair,’ in Oakland, Maine. If ever a homeless person wandered into this particular town, they were imprisoned in the chair for a day. They were wheeled down to the river, and they were given a bath in the river, and then they were wheeled around town to the jeers from people who were probably throwing rotten vegetables at them. As soon as they got out of the chair at sundown, which is when they were released, they ran for the border and told everyone they could to never go into Oakland. At the Columbian Exposition of 1893 in Chicago, engravers set up booths all around the world’s fair to make attendees love tokens on the spot. That seemed to be the saturation point for love tokens, and soon after, the fad started to die out. Bastable, Gale, and other members of the Love Token Society have speculated as to what brought down the trend. “Also, if you look at antique jewelry books, you’ll see that 1900 was the heyday for lockets, many of which were made of gold or gold shell and have beautiful repoussé designs or are set with stones,” she continues. “By then, photography had become more commercial. Paper photographs were more available and affordable, so it’s clear the trend in sentimental jewelry switched to lockets.” Sometimes love tokens were even made into lockets, but those are extraordinarily rare. Starting around the first World War, Art Deco “Machine Age” jewelry that looked like metal assembly-line equipment came into vogue. 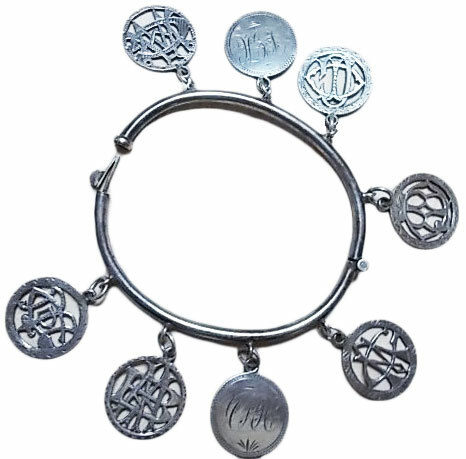 As World War I served as a stark reminder of mortality, women took to wearing sentimental jewelry again, known generally as “sweetheart jewelry.” But instead of love-token bracelets, they favored mass-produced bracelets with rectangular Machine Age links called “forget-me-not bracelets.” Each rectangle could be engraved or struck with a name. And these bracelets remained popular through the 1930s and ’40s. When the United States entered World War II in 1941, a patriotic fervor swept across the country, and sweetheart jewelry exploded. Within a few short years, nearly every woman had someone—a son, a brother, a boyfriend, or a husband—serving in the war effort. In particular, the women with loved ones overseas would proudly wear heart-shaped pins and pendants with images of stars and stripes, bald eagles, shields, fighter planes, and military insignia. Love tokens were just one small part of this broader trend. 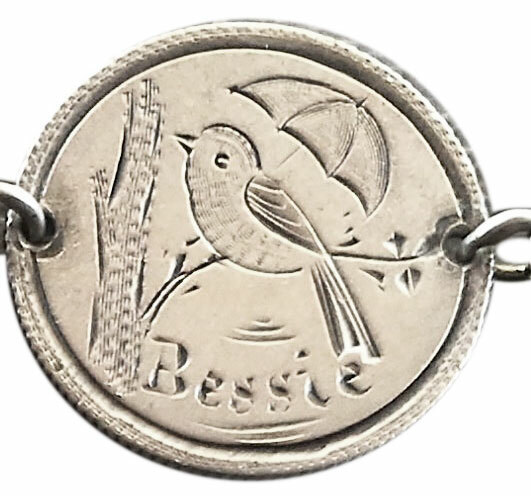 “In World War II, you might have a few that were engraved with serial numbers or service numbers of the men on love tokens, but more often, love tokens were made into jewelry and sent home to women—their mothers, their girlfriends, their sisters,” Bastable says. Most of the World War II love tokens came from the Pacific Theater and were engraved on Australian coins, which were used to pay U.S. servicemen. Known as “Pacific War Art,” these love tokens might be linked into bracelets or cut into hearts and embedded into heart-shaped pendants of Lucite from the windows or canopies of downed airplanes. After the war, love tokens fell out of favor once more. During the ’50s, charm bracelets took over as the sentimental jewelry du jour. Women and girls would be given charms to honor milestones such as birthdays and anniversaries, or they would buy charms as souvenirs of trips. Mothers often had a charm for each or their children. Some even bought flat charms shaped like silhouettes representing boys and girls, and had each engraved with one of their children’s names. Love tokens, meanwhile, faded into obscurity for nearly 70 years. Another genre of antique altered coins, hobo nickels, started getting attention in 1982, when Del Romines published a book on their history. 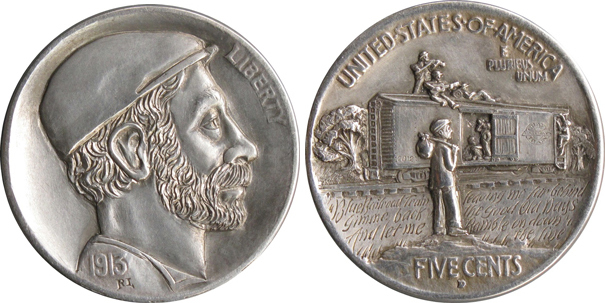 Hobo nickels—which, unlike love tokens, were sculpted to alter the coin’s original image—were made and traded by hobos in early 20th-century America. In the early ’80s, so called “neo-bos” started whipping out quick modern hobo nickels. But later in the decade, a serious artist named Ron Landis took coin carving to the next level, making laborious, intricate hobo-nickel designs using a microscope and pins and needles. Some of his pieces have sold for $10,000. Even today, love tokens are a niche genre and not the currency of romance. Both Gale and Bastable believe that’s because people are far less sentimental. Indeed, it is a cynical world we live in—today, it would be a rare sight to see a woman on the seashore, clutching an engraved coin, wondering when her love is coming home. Really a great article! Surprising how many people never heard of love tokens. Regarding the relationships engraved on love tokens eg Mother, Sister etc, you mentioned ‘Nanny’ and in working-class Britain, ‘Nanny’ was another name for a grandmother, and not an woman employed to look after small children. My nephews’ two grandmothers were called Nanny Glo and Nanny Jean respectively, so everyone knew who was being referred to. Worked for us! It was great reading the love token article. I wear a gold bracelet loaded with gold love tokens and gold lockets and through the years I have managed to find these stunning pieces with all of my relatives initials. I always get compliments on it and will proudly pass it on to my children. I just hope they will treasure it as much as I do! Love your love tokens even if I have $20,000.00 of love tokens. I found one $5 gold love token 1868 and the history of the iron factory near Harisburg Pa.
Years ago I found one of these while gardening. I was always wondered why it was a ‘dime’ on one side, when very obviously it was some sort of memento regarding someone’s “Mama”. I had no idea of the tradition of these love tokens. Great article. “ ” A lock of the mane on the other side of the neck might be beautifully carved, and there's no reason that it needed to be.